Five developers have been shortlisted for a multi-million pound development site in Bristol city centre. 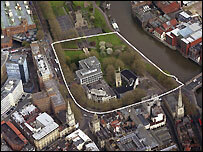 The St Mary le Port site covers the historic Castle Green area. Amec Developments, Deeley Freed Estates Ltd, Development Securities, Grosvenor Investments and Helical Bar have been shortlisted by Bristol City Council. A spokesman said the list was compiled after a selection process based on the companies' track record of delivering comparable projects. The shortlisted developers will submit full development proposals during the autumn, with the final partner expected to be selected by the end of the year. The scheme is likely to be a mix of offices and residential with retail, leisure and associated uses at ground floor.